Today is International Day of Persons with Disabilities here in Canada and around the World. To mark this occasion, The DisAbled Women’s Network of Canada – Réseau d’action des femmes handicapées Canada (DAWN-RAFH Canada) is pleased to launch a new resource aimed at understanding and addressing violence against women with disAbilities and Deaf women. Produced in collaboration with The Learning Centre at University of Western Ontario’s Centre for Research and Education on Violence Against Women and Children, this Resource and Educational Tool highlights the context of violence experienced by women with disabilities and provides statistics and important resources. 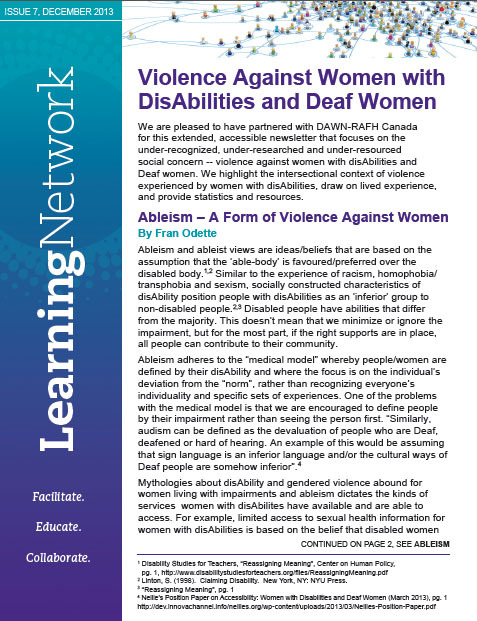 Based on both research and the lived experiences of women with disAbilities and Deaf women, this publication sheds light on the range of ways in which women with disAbilities experience violence – physical, sexual, psychological, and financial at the individual level, as well as naming ableism and audism as forms of violence against women with disAbilities and Deaf women. On Monday, December 9th, we will host a second launch in Montreal in French and Langue des signes québécoise (LSQ) in the presence of our Minister for Status of Women Canada, the Honourable Kellie Leitch.